Hit Z Road – A Road-Trip to Remember! Are you planning your summer vacation? Well, pack your bags and fuel your vehicles, because it’s time to Hit Z Road! 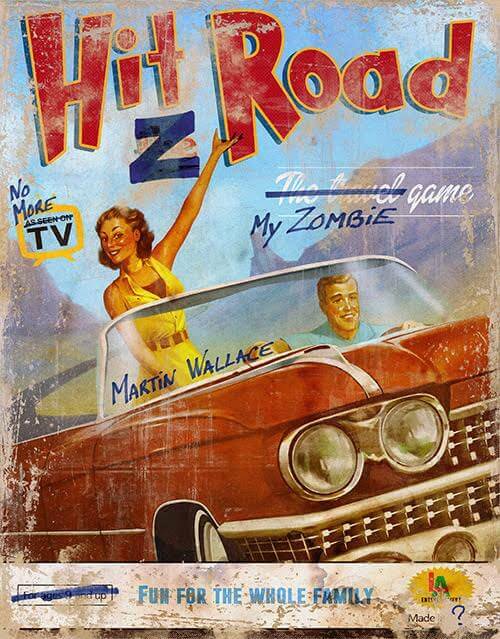 It is the new zombie road trip game by Martin Wallace and it was one of the biggest hits during Gen Con, since it attracted many players with its thematic presentation and intuitive gameplay. In Hit Z Road, you and your friends are going to drive through small-town downtowns and witness the vastness of the American countryside. However, your road-trip will become more and more difficult, as zombies devour and zombify everything else along the way. Your travels are divided into three stages of increasing lethality and they are represented in the game by a deck of adventure cards. On your turn, you gain any gear indicated on a card, you encounter any text on it and finally, you battle zombies. But unfortunately, your band of survivors may start to die off in frightful combats and tragic accidents. Your goal is to make it all the way through the deck of adventure cards. If you do so, you have arrived at L.A. and if you are the only player whose band of survivors has made it to L.A., you win. Otherwise, the player with the most victory points wins. Moreover, an auction takes place at the beginning of each round, during which you can bid any number of tokens indicating gas, adrenaline and bullets, having the right to choose your route through the adventures ahead of your rivals. Hit Z Road is a fast-paced and aggressive adventure game which will be available by the end of August. Hordes of zombies are out there! But are you going to cancel your road-trip just for that? Read our great review by Grantelith!